Here’s the cool thing about throwing events. You don’t always have to cook to bring delight to a party or potluck or even a holiday meal. Gathering the right ingredients and making your food interactive will make it FUN. 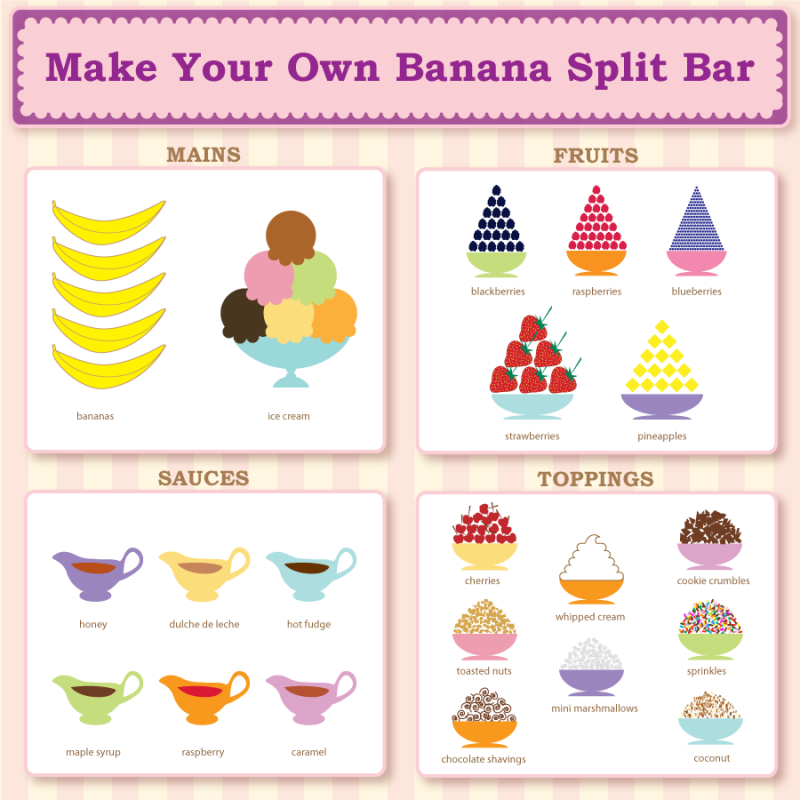 Set up a banana split bar so your guests can make their own. Who doesn’t LOVE a banana split? If you’ve got a fussy friend or two, don’t invite them. Just kidding, there’s plenty of options for them too. They can just have ice cream or just bananas or eat their weight in maraschino cherries. Everybody’s happy! You don’t need all of the items under ingredients… unless you enjoy a bit of overkill like me. Use your favorites or try one of the less processed, artisan-made alternatives I’ve listed below. For a potluck, ask each guest to bring something from the list! Caramel sauce - Try the salty caramel from my hood in Brooklyn that Spoonable makes. Cajeta (goat milk caramel) - I love the one from Fat Toad Farm. Maraschino cherries - Cherry Man makes all natural non GMO ones. Griottines - French liquored up cherries = UNBELIEVEABLE! Amarena Cherries - Italian liquored up cherries = STUNNNING! Toasted Coconut - I love the Dang, That’s Good coconut chips. Your choice of ice cream—I like to have at least three or twenty, but you can have as many as you like. To brûlée the bananas, place a rack over a sheet pan. Slice them, lengthwise and lay the bananas on the rack. Cover the cut side completely with sugar. Turn on your blow torch on. Hold it so that the tip of the flame just touches the banana and move the flame back and forth, quickly until the sugar melts, caramelizes (turns brown), bubbles and looks like glass. DO NOT TOUCH IT, until they are cool. If you don’t have a blow torch, you can use your broiler, but move the pan frequently to brûlée them evenly and check them every few seconds because they burn easily. Take the ice cream out of the freezer, for 5-10 minutes, so it softens enough for scooping. Right before serving, place ice cream containers in a large plastic bucket, surrounded with crushed ice, then salt the tops of the ice to keep it from melting. Yield: Depends on how many ice cream fiends you've invited.